5 stars - "Printer Epson WorkForce Pro WP-4545DTWF with refillable cartridges" by Zion	, Written on 2012, 18:52/07/27 It works productively. Im sattisfied. 4 stars - "Printer Epson WorkForce Pro WP-4545DTWF with refillable cartridges" by Justine, Written on 2012, 12:54/11/27 Good all-in-one. It is easy to refill these RC and you can add ink thousands times. Scanning can be quicker, but in general it doesnвЂ™t spoil the impression. 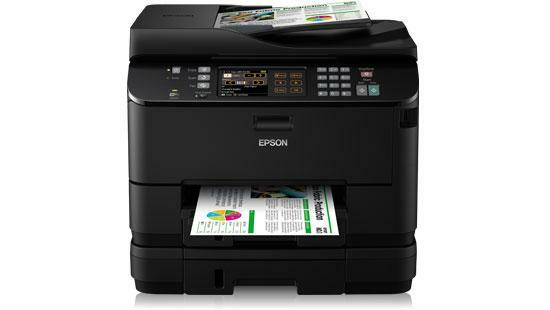 Buy Printer Epson WorkForce Pro WP-4545DTWF with refillable cartridges and make 30 times more quality prints for the same money! Pay only 0.04 USD for A-4 full color print! We offer for your attention the Epson WorkForce pro wp-4545dtwf multifunction device for either office or home use, which can reliably help you in all your missions. With its high productivity and great variety of functions the device has some advantages as compared with similar equipment. The main one is its price. The device is provided with a lot of functions. They are scanning, copying, monochrome and multicolor printing, fax exchanging. Therefore, the printer model, we offer, will let you print high quality photos, advertising stuff and a lot of other office documents. With its wide range of functions, this printing device costs much cheaper, than a set of separate office facilities, you would have to buy in order to get all those functions. Isn't it a real money saving? Besides, while you are saving money on purchasing office equipment, you will be able to save your working time and space. This is the reason for this multifunction device to get so popular among our Customers. Possibility of using CIS system. Those who have a lot of printing work know, that it may cost a lot of money. Is it possible to save money to be spent for printing without loosing its quality? In case of using the WorkForce pro wp-4545dtwf printer MFD in combination with continuous ink supply system, you will pay only for ink and paper. You will not need to buy plastic containers and overpay for them every time. With the CISS one cartridge will be enough for the whole duty life of your multifunction device. Besides, the MFD equipped with CIS system can be refilled without its switching-off, in process of printing, and this will not affect the quality of prints. In order to refill the printer, the only thing you need is to add ink into appropriate tank in time. The WorkForce pro wp-4545dtwf printer with CISS, which can scan, copy, print both monochrome and multicolor images, as well as send and receive fax messages, will pay for itself in a short time. Therefore, such an inkjet printing device will perfectly satisfy those, who plan to start their private business or set up mini photo laboratory at home. If this MFD model has interested you and you have decided to buy it, please do it right now on our on-line shopping site. We have great variety of printing equipment for the best prices. Besides, our advisers will give you detailed information on the proper maintenance and operation of our printing devices. With help of INKSYSTEM on-line store you can as well order Epson WorkForce pro wp-4525dnf and Epson Stylus sx130, if other machines with similar functions are interesting for you. It works productively. Im sattisfied. Good all-in-one. It is easy to refill these RC and you can add ink thousands times. Scanning can be quicker, but in general it doesnвЂ™t spoil the impression.